Thrilled by the idea mentioned in “When Things start to think” by Neil Gershenfeld i started to build a near-field intra-body communication device to transmit data through a body by capacitive coupling. 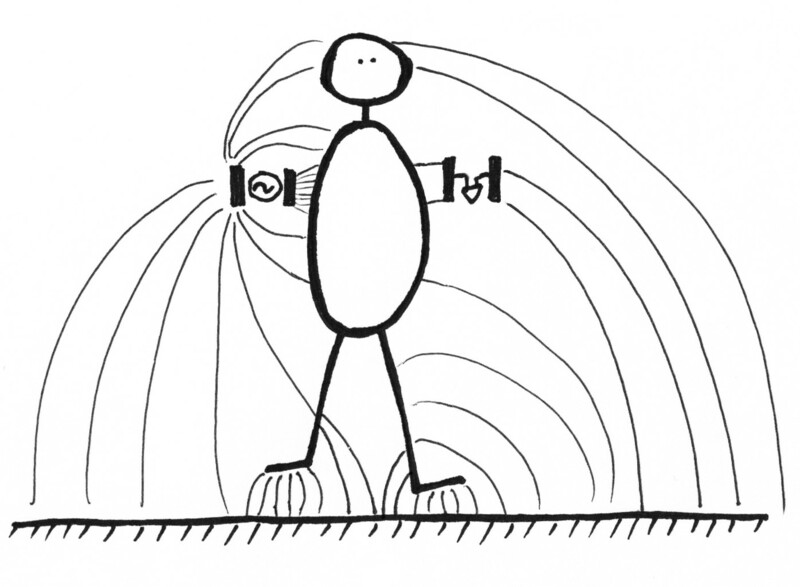 Everything written down in this post is based on the original paper by Thomas Guthrie Zimmerman “Personal Area Networks (PAN): Near-Field Intra-Body Communication” – published at the MIT in 1995. 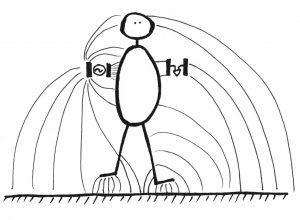 Using the body as a communication channel is an interesting approach to send sensor-data from one part of the body to another part of the body – or to another body. This may be very useful for e-textile projects. Especially when it is not possible to use conductive material to transmit data. The goal of the workshop was to come up with a simple circuit to demonstrate the principle of a capacitively coupled data-channel involving as less parts as possible. Disclaimer: While the project suggests to carry a transmitter close to the body, the project presented here does not allow this. 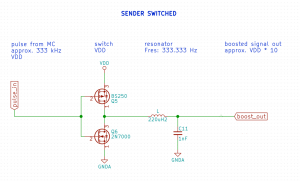 When the transmitter-circuit is too close to the body the signal gets disturbed and transmission may fail. 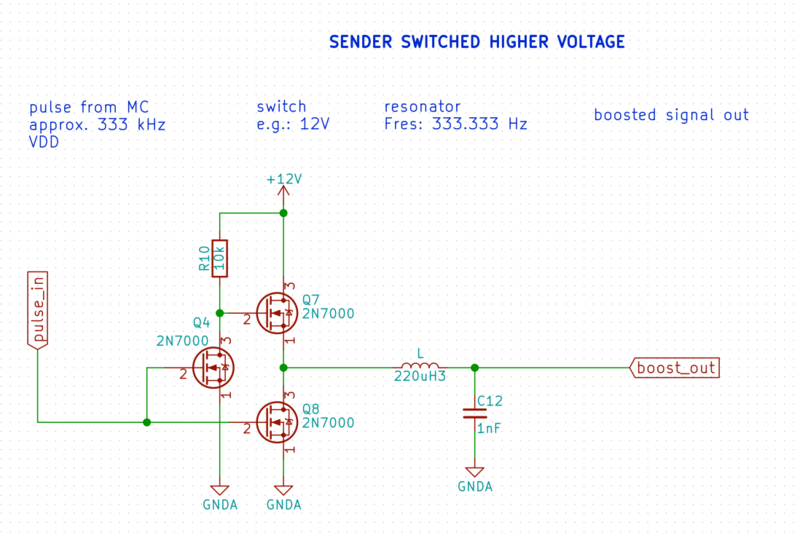 Shielding the transmitter-circuit may help. 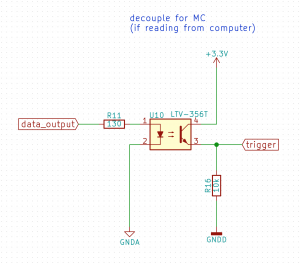 An updated version of the circuit may solve this problem. In general terms a PAN transmitter perturbs the electrical potential of the environment and the receiver detects these perturbations. 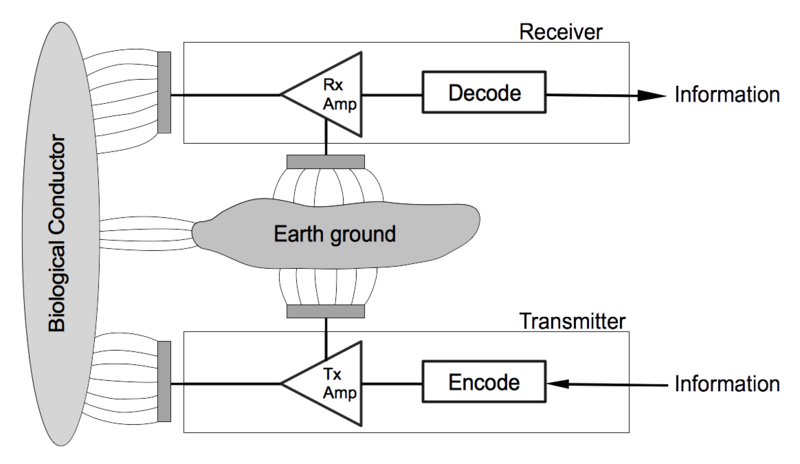 Another way to state the communication mechanism is to say the transmitter is capacitively coupled to the receiver. 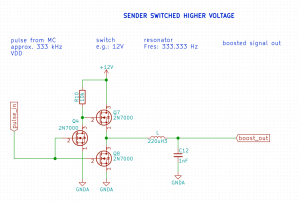 This generates a higher-voltage sine-wave out of the input low-voltage signal. Make sure to electrically isolate the electrodes to avoid resistive coupling, we only want to couple capacitively. Dependent on the components used, direct contact to the human skin may draw to too much current from the receiver and break it. 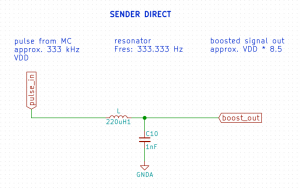 The disturbed square-wave (yellow) is expected, we are only interested in the sine-wave on the output. Be aware of too high voltage which is unsafe to use! The receiver needs to pick-up the signal. For this we need to filter, amplify and clean (threshold) the signal. 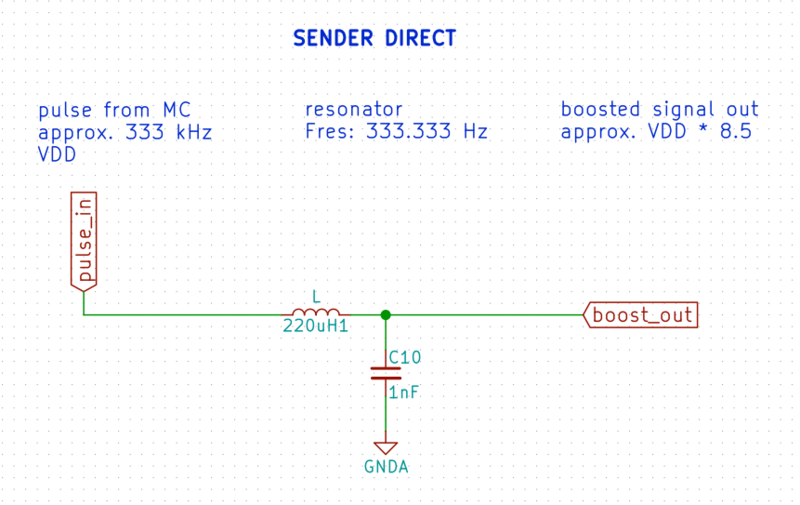 The circuit is using two envelope followers to smooth out the signal and to avoid breaks in the bits. Make sure to isolate the electrode to avoid resistive coupling, we only want to couple capacitively. 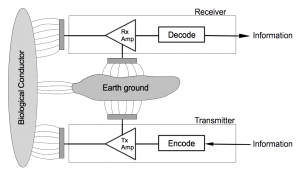 Connecting data output to a device directly may change the earth-ground coupling of the circuit and therefore the sensitivity of the receiver. 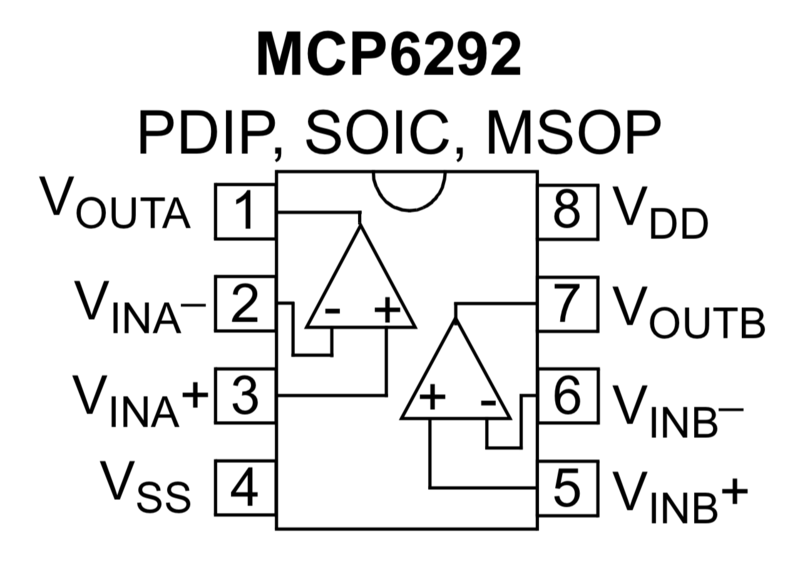 The opto-coupler may be skipped when reading data-output directly with a micro-controller (e.g. Attiny). 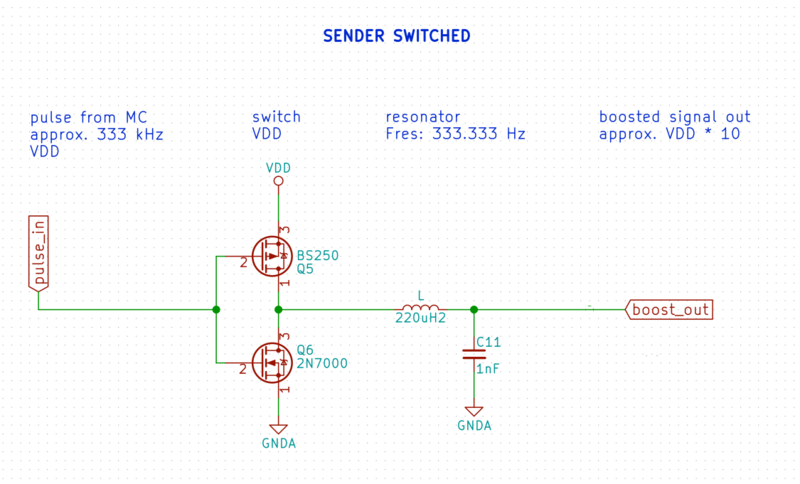 In any way, decoupling the receiver circuit i a good idea. Data is encoded using On-Off-Keying (OOK) where a Logic 1 turns the carrier-wave on and a Logic 0 turns the carrier-wave off. For the workshop we are using a period of 200 microseconds for one bit. Using a carrier frequency of 333kHz a logic 1 contains ~66 cycles of the carrier wave, enough time to be sure we got a high-bit. This allows a data-rate of about 5000 bit per seconds. To identify the start of incoming data we send a 8-bit preamble in the form of 10101010. Only when this preamble is detected the decoder accepts bits as data. Manchester Encoding would be another strategy. 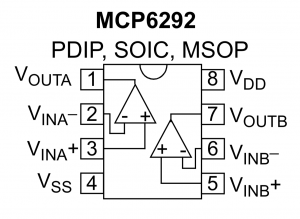 This would allow transmitting the data-clock, the receiver would not need to know the exact timing of the data. The decoder starts with being in preamble-mode. Only if a preamble was detected the decoder accepts data in data-mode. Whenever the decoder detects a rising-edge on its input-pin a logic 1-bit is detected and pushed into either preamble-data or data. It also starts a timer with a short offset for the next expected bit. 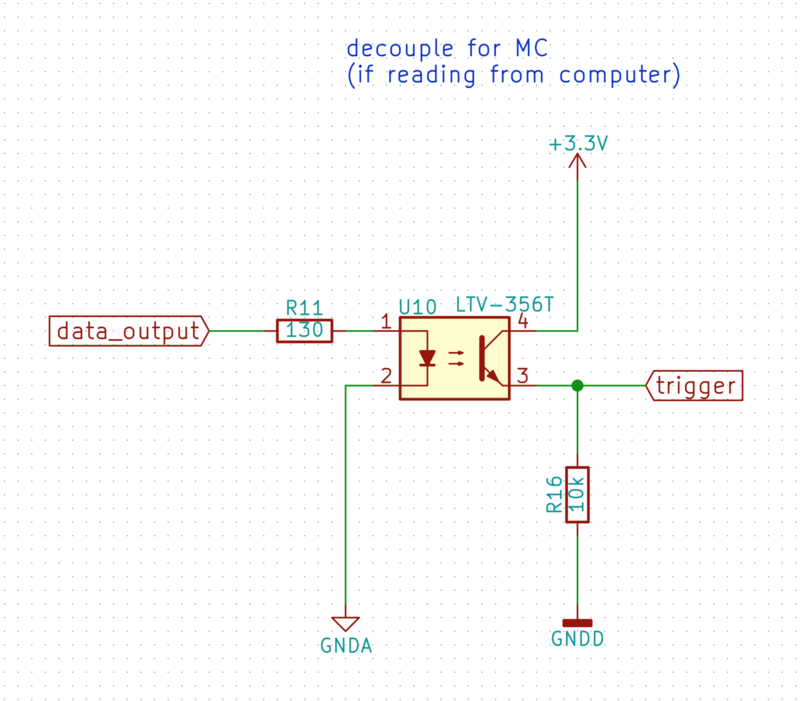 When the timer is executed a ~300 micro seconds later we can read the next bit (0 or 1) on the input pin and start another timer with exactly 200 microseconds. If the incoming bit was a 0-bit and the next bit is a 1-bit, the rising-edge will happen before the next timer-interrupt and starting over the procedure. If the next bit would be the same as the last bit, the timer would fire after 200 microseconds to read the next bit. This strategy avoids timing-shifts, as it re-calibrates the timing every time a high-bit is detected. Slight shifts in timing may happen if the same-bit value is transmitted more often. This could be fixed by using Manchester encoding.